Do you have pets? Or do you love animals? Celebrate them with this easy, quick mug rug. You can use up some scraps to applique these cute animals onto a fun background. 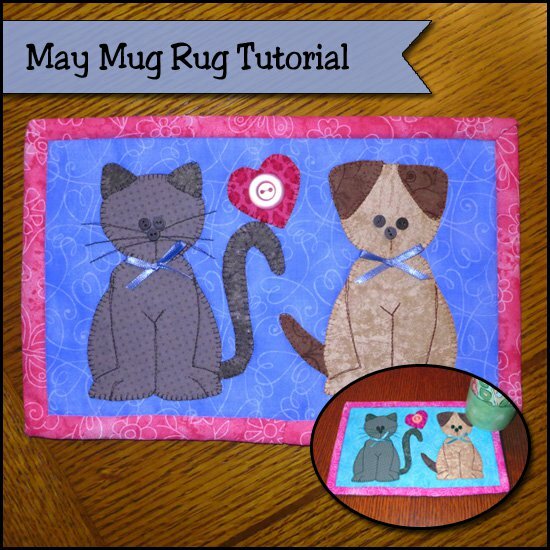 "Mug rugs remain so popular! This is probably for many reasons. They are super easy to make, they can be made using your favorite techniques (hand or machine), they make great gifts, and they can be decorative as well as functional. Most of all, they are so much fun!" "A FUN VARIATION: If you are a cat person, and not a dog person, make two cats, and vice versa for dog lovers. I have one of each, so I am putting one of each on my mug rug. You can even make just one animal and embroider or paint (with fabric paint) your pet’s name(s) on it. Great gift idea too!"